Over the summer, various changes were made around the building in High School East. Perhaps the most exciting change, intended to alleviate the congested halls, is the hallway located behind the gym. It finally made its debut after being in hiding for what seemed like forever. Its construction began towards the end of the 2015-2016 school year, and it was finally ready for access in the fall of 2016. It caught many students by surprise as most did not even notice its presence until its official grand opening this school year. Since it is slightly more narrow than the other hallways around the school, this may take some getting used to as students learn to navigate the best path between their classes. On the bright side, it is lined by a large window that overlooks the new tennis courts for students to view and lets sunlight into the building. 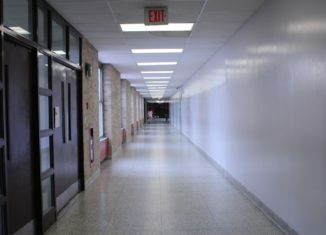 The main reason this hallway was created was because the one hallway running along the front of the gym was not suitable enough for all the traffic passing between the east and west sides of the building on a given day. This constant traffic often results in students arriving late to classes. This is not only inconvenient for students, but it is also an inconvenience for the teachers since they only have forty minutes to teach, and they will have even less time if students are always coming in late due to the hallway traffic. Some may wonder what the point of the new hallway is when we already have the gym to walk through. While one intent of the new hallway is to alleviate traffic, another is stop students from walking through the gym when physical education teachers are trying to set up for their next classes in between periods. While walking through the gym, students were also extremely disrespectful leaving behind garbage and other items in their wake. This behavior was unacceptable and measures needed to be taken. As a result, the new hallway was created to resolve this problem. So, the new hallway debuted, and all problems were solved, right? Well, not exactly. Traffic is definitely less severe with another hallway; however, lateness is still an extremely common problem in the building even with the new hallway. The only true resolution to this lateness is hustling as fast as you can to your classes, even if you are trekking from foreign language to art. In reality, a majority of the lateness issues would be resolved if students did not stop to chat in between periods and actually tried to get to their classes on time. If students wish to chat in the hallway, they must multitask and walk fast while doing so. Also, students who are making locker stops should plan accordingly with regard to the best time to stop or maybe stop before lunch when they have much more time. If you have yet to try this path of less resistance, check it out. It’s bright, cheery, and a lot less crowded! Train Accidents: Will They Ever Stop?